Incredible mosque, bears the name of King Hassan II, seems to be ready to soar off a cliff over the Atlantic, and ascend to the heights of heaven. 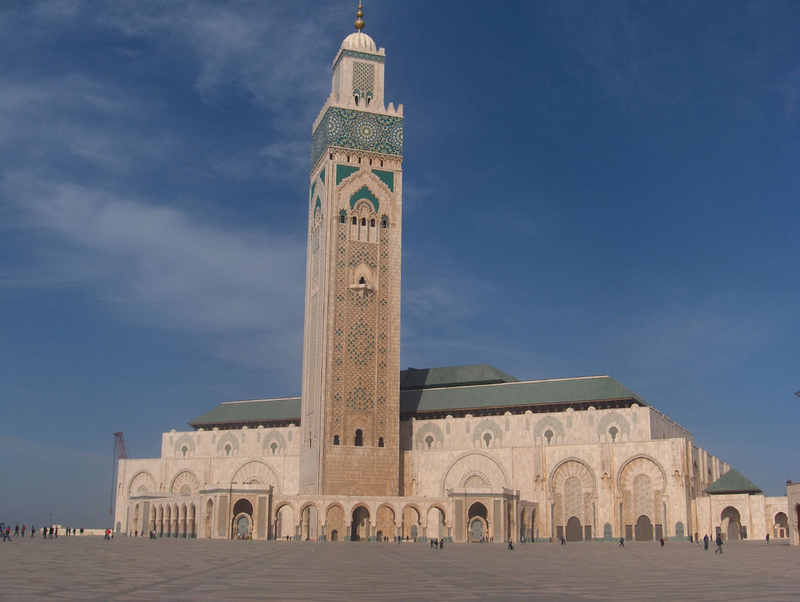 The main attraction of Casablanca is one of the most remarkable mosques in the world. It can boast of 210-meter minaret, located exactly above the stormy Atlantic Ocean and the mass of cutting-edge chips, such as a retractable roof, a heated floor and a laser beam, which rises directly to the Mecca. With a total number of worshipers at the same time, exceeding 100 thousand people, the Hassan II Mosque is the third largest in the world. In short, this building is certainly needed to see! The first stone of the mosque has laid the King of Morocco, Hassan II. It happened in 1986, and after only three years, monumental building was completed. The architect of the mosque was the Frenchman Michel pins. However, before the opening of the mosque for the believers was still far: nearly in four years the work was finished. Tens of thousands of designers and craftsmen worked on interiors: laid mosaic, decorated rooms, did woodcarving, placed stone columns, laid marble floors. The mosque was opened to the public in 1993 and immediately became one of the wonders of the Muslim world. Mosque Hassan II is a large-scale architectural complex of 9 hectares, in which attention should be paid not only to a religious building, but also a vast surrounding area. Half of the complex is located just above the Atlantic — on a platform supported by pillars. In the hours of high tide the water fit flush with the base platform, and creates the illusion that the mosque sweeps over the waves. In the courtyard of the mosque there are a riot of colors and splendor of finishing materials. It’s hard not to notice the 78 columns of pink granite and the floor which is lined with regular alternation of gold and emerald onyx marble slabs. The splendor of the main dome of the mosque is laid out a bright-green tiles. Minaret ascended to a height of 210 meters — a world record. Powerful laser projector in its top tier in the dark shining towards Mecca takes the space of 30 km. The roof of the mosque can be moved apart in a good weather or stay in the assembled state, protecting the worshipers from the rain and wind. The floors in the prayer hall of the mosque are heated, and the building was built in a strict accordance with the canons of seismic resistance. By the way, in the prayer hall can simultaneously pray 25 thousand Muslims. Pay special attention to the crystal chandeliers. Each of them weighs 50 tons, and it is the only decoration of the mosque, which was imported from abroad — from Italy.